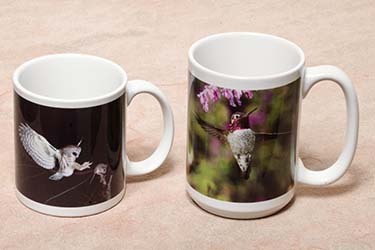 Our photo mugs make great gifts for parents, grandparents, friends and relatives. 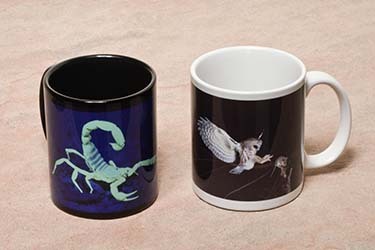 Images are printed from high resolution digital files onto high-quality cups. Coffee mugs are available in white or black in the 11 oz size, and white only in the 15 oz size. All mugs are microwave and dishwasher safe. 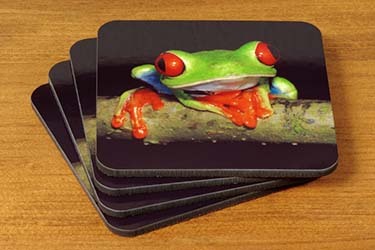 A set of 4 sleek, custom ceramic coasters features your choice of photo from our web site. Use for hot or cold beverages, with no-slip cork backing. These beautiful coasters are approximately 4" x 4". A thoughtful and useful gift idea, or grab a set for your own house or office! A high quality card deck is shipped in a convenient plastic storage case. 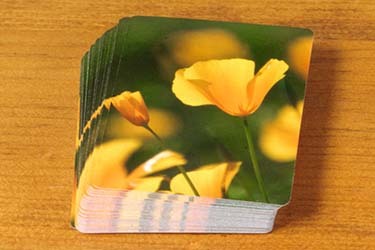 The back of playing cards are printed with an image selected from our website. Perfect for birthdays, anniversaries, weddings or graduations or as a stocking stuffer! Create a personalized puzzle with your favorite photo! Our 252 piece puzzle comes in pieces in a designer box with a print of the photo on top. Dimensions of the finished puzzle are 10" x 14". 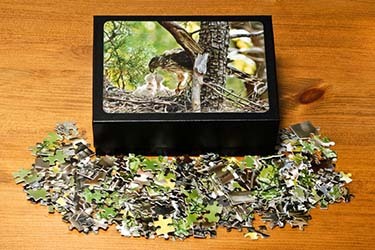 Puzzles make great gifts for kids, grandparents, birthdays and anniversaries. Create a personalized greeting card with your favorite photo! Classic folded cards with your image selection on front. Heavy 110# paper stock ensures excellent image reproduction. You'll be proud to send these 5" x 7" cards to friends and family. Envelope included. 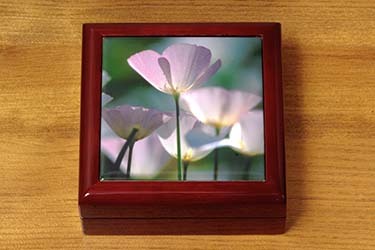 High-quality coffee mugs, playing cards, coasters, jewelry boxes, mouse pads, puzzles, magnets and greeting cards can be ordered with imprinted photos from our web site. Our photo products make great gifts for parents, grandparents, friends, relatives and co-workers. Images are printed directly from high resolution digital files. To order photo products, first locate the image that you want to use (start here: Galleries), then click "+ Cart" to add the image to your shopping cart. Next, click on Products, add the desired quantity on the left, and lastly click Add to Cart or Add and Check Out. You will be given additional instructions for cropping, etc. In beautiful hardwood with a glossy mahogany finish, this elegant keepsake box is lined in vanilla velvet. When you open the box, the lid stays up until you close it. 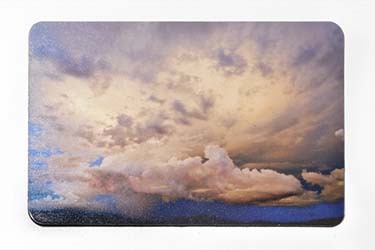 The photo is beautifully printed on ceramic tile to maintain color and detail. Box measurements 5.375" x 5.375" x 2.1875." 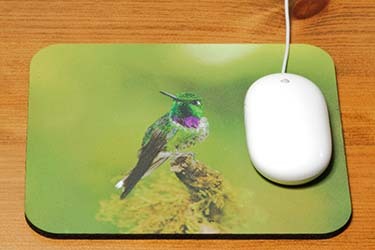 Personalize a mousepad with your favorite photo! Our mouse pads are made of high density foam with an easy to clean, stain resistant finish. Approximately 7.75"x9". These are a wonderful gift idea for teachers, professionals, students. 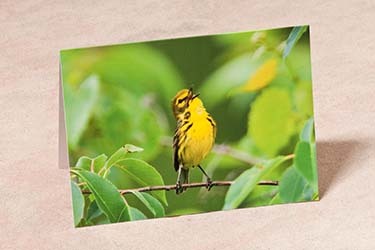 Create a personalized magnet with your favorite wildlife or nature photo! Rounded edges and magnetic backing. Magnet is approximately 3" x 5". A thoughtful gift for kids, parents, grandparents, teachers, and clubs. Decorate your refridgerator with several!